If you are based in the UK the deadline of the 31st January is looming for online self-assessment tax returns. If you are yet to complete yours the pressure is now on as late returns come with a hefty fine of £100 for one day after the deadline and further penalties thereafter. Despite the deadlines and fines being highly publicised, approximately 750,000 people missed the deadline in 2018. As a small business owner or sole trader, it is likely that the list of things to do constantly outweigh the available time to do them. Even if you have an accountant it can still take a lot of time to sort through all the receipts and invoices if you don’t record them regularly. I have personally spent whole days trying to get everything together and then sending them late December or early January to the accountant. This puts pressure on everyone, especially my accountant who is likely receiving many sets of accounts at a very late date. As a business owner, tax returns are here to stay, so it is worth spending time to get systems in place and get into good habits as April 2019 will see changes to the way that HM Revenue and Customs (HMRC) collect taxes from VAT registered businesses with a taxable turnover above £85,000. The new rules come under the Making Tax Digital Initiative (MTD) that stipulates that registered companies that meet the VAT threshold have to keep digital records and submit quarterly returns using compatible software. This article contains affiliate links. See full disclosure here. The list of compatible software is quite lengthy and it could take you a number of days to just review what is out there. I have decided to try out Sage Business Cloud Accounting. They offer a free 30-day trial to explore all of their features and to see if it is the right product for you. The sign up process for the 30 day trial was straightforward. Not too many initial question and you don’t have to provide any credit card details. Once you are in there are plenty of instructional videos and detailed articles offering step by step guidance to setting up your account and getting the most out of it. In a matter of minutes I had my bank account connected and a Stripe account integrated to take payments for my services. Doing this allows you to draw information direct from your bank account and have up to date information of all the transactions. Once you are in the dashboard you can see a comprehensive list of options and settings. Whilst this may seem a little overwhelming initially, there are plenty of videos and articles providing step by step instructions. Whilst some of the functionality is not applicable to my current circumstances, it is well worth thinking about the long term plans of the business and what may be needed further down the road. If you take the time to look at the options and customisation settings you can see that ultimately once set up you can save a lot of time and have the ability to know the exact state of your business finances as you will have real time data. The reporting functions allow you to create a balance sheet, VAT returns, profit and loss and a lot more…. In the recently submitted article A Hobby or a Career? 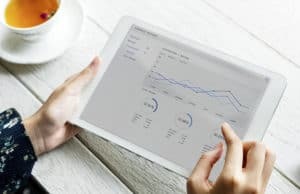 13 Ways to Take Your Business Seriously keeping track of your expenses is listed as one of the essential things to do. By using cloud software such as Sage Business Cloud Accounting I feel that you can take your business and finances seriously. After all, finances are at the heart of the business. I am looking forward to exploring this inexpensive software further and getting rid of my spreadsheets, and working collaboratively with my accountant who can gain access to the software with my permission. If you have a registered business with a taxable turnover above the current threshold of £85,000, it may be better to start exploring the cloud accounting options sooner rather than later so that you can be ready for April 2019. Even if you do not reach the current VAT threshold you can still choose to operate MTD. It is envisioned that all businesses and landlords (except the very smallest businesses with a turnover of less than £10,000), will be filing their tax returns this way within the next three to five years.